I’m absolutely delighted to announce that we have a new baby girl to add to the greater Lattimore family, Grace Ivy Lattimore. 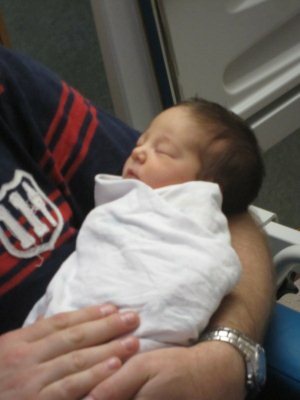 After a long wait and a lot of heartache, my oldest brother Phil & his wife Tammi welcomed Grace into the world 10 days early at 1:48PM on Saturday 12th March 2011 – weighing in at 5lb 15oz and 46cm long! Claire, Hugo, Evie and I dropped into St. Vincents Hospital in Toowoomba on the way back to the Gold Coast to meet our newest niece/cousin and it was such a happy meeting. Grace is a gorgeous little girl and I’m now looking forward to Evie having another cousin a similar age to play with in the near future. There is just something completely amazing about meeting a fresh baby, it is the miracle of birth realised in the flesh so to speak. Congrats to both parents and extended family ! For a family of four brothers, the Lattimore clan is gettin lucky with these girls. I ribbed Cameron when Maggie was first born as a joke, saying that he was letting the team down by having a little girl – it was all in good fun. After having Evie, I’ve decided that little girls are quite delightful & Claire is right – they are so much better to play dress ups with than dolls! I think the fact that you’ve got ya little man to do bloke stuff with is just as aswome as claire being able to play dress ups with a real baby girl.. Very lucky parents !